Facts, no prepared defense and the plaintiff will get to go to trial. In this case, I think the parents of a child who was attending the summer camp opted to ride the camp zip line. The zip line had two ropes that attached the rider to the haul line. The adult plaintiff when getting ready to ride wrapped one rope around his fingers. When he launched, the rope tightened almost severing his fingers. The defendant filed a motion for summary judgment. However, the analysis by the court did not read like the normal decisions on motions for summary judgment and started out by denying part of the plaintiff’s argument. The plaintiff argued the summer camp, landowner, owed him a duty of ordinary care. The court found this really did not apply to this case, and the duty was a duty to disclose rather than a duty of ordinary care. However, the court allowed this argument to proceed. c) fails to exercise reasonable care to inform them of its dangerous condition or of the facts which make it likely to be dangerous. The court then argued that the plaintiff was arguing the wrong legal issues because the plaintiff was arguing the plaintiff was a landowner; however, the injury did not occur on the land. Because the injury the plaintiff received was based on the acts of the plaintiff, wrapping a rope around his hand, there was no violation of a duty by the defendant. Q. Did you know that if you wrapped the rope around your fingers, and then you put weight on the rope, that would tighten and cinch around your fingers? A. The thought did not cross my mind. Q. Okay. You didn’t think about that correct? Q. But if you had thought about it, you would have been able to figure that out, correct? A. If someone asked me? Because the plaintiff admitted that if he thought about it, he would have realized that his actions would injure his hand, the defendant did not owe him a greater duty than it had done. The plaintiff then stretched with two additional causes or claims. 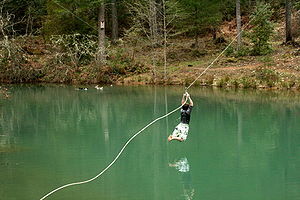 The first was the defendant had violated a state statute because the zip line was not inspected by the state. However, the statute that the plaintiff tried to apply, the amusement ride statute, did not include zip lines in its definitions until after the plaintiff’s accident. The statute at the time the plaintiff was injured did not apply to zip lines. The next argument is farther out there, and exponentially scarier. The plaintiff argued that a zip line should be classified as a common carrier. A common carrier under most state interpretations are airlines, trains, buses, etc. Those types of transportation, carriers for hire, where the customer pays to be moved from one place to the next owe their customers the highest degree of care. The transportation must be for the purpose of movement, not amusement. The scary part is a common carrier owes the highest degree of care to its customers. This definition means that a common carrier is liable in most situations for any injury to its passengers. However, the court did not find a zip line was a common carrier. Thankfully. The obvious issue that was missed, was the camp should have been using a release. An adult is on the property having fun; an injury will occur. A motion for summary judgment is used when the legal arguments against a claim are sufficient to eliminate that claim. In most cases, this ends the lawsuit as long as all claims are ruled in favor of the defendant. Here the one claim, no matter how sketchy is probably going to allow the plaintiff to recover some amount of money. Based on the ruling, the plaintiff will get his day in court or be paid not to go to court. A slip when someone is loading a zip line, no release and a traumatic injury add up to a big lawsuit.